Measuring and sizing your window in anticipation of your custom blinds and shades from The Home Depot is relatively easy and hassle-free. An accurate measurement ensures a great fitting custom window treatment, which adds an elegant and classy touch to your home or office. We've made the process easy for you to do yourself, which saves you money without sacrificing quality. To get started, first choose the window covering you are interested in and whether you want to use an inside mount or an outside mount. Download this worksheet to record your window details, then bring it in to your local Home Depot and select the window treatments that are right for you. Read on for simple instructions, or watch our quick two minute video that teaches you how to measure for blinds. Looking for the perfect fit for a new window treatment? It all starts with an accurate measurement. 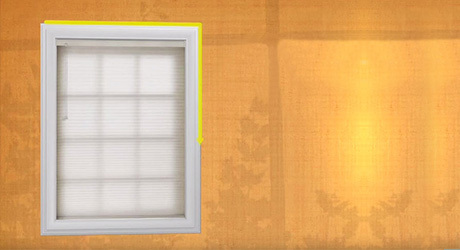 First, determine if the window treatment will be installed as an inside mount or an outside mount. 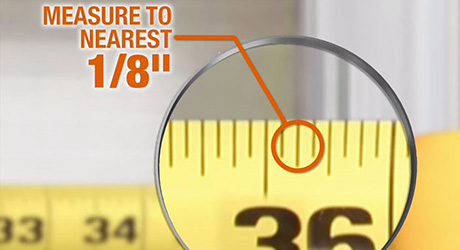 Use a metal tape measure to measure accurately to the nearest 1/8th inch. Do not take deductions. Inside mount treatments are installed inside the window casing. Measure the inside of the window frame in three places for width: across the top, middle and bottom. And for height: at the left, middle and right side. Record the narrowest width and longest height. 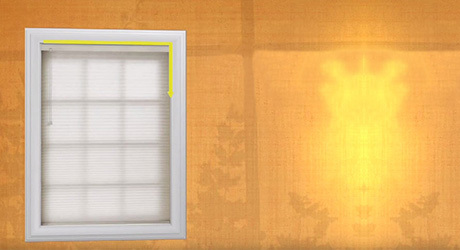 Don't forget to record window depth so you'll meet the minimum installation requirement. Outside mount window treatments are mounted outside the window casing. Measure the overall area to be covered. Consider adding an extra 3 inches to the width and height for optimum light control and privacy. Outside mounts require at least 2 inches of flat surface above the window or frame for mounting brackets. Projection brackets may be needed to clear the frame moulding. Most hardware packages come with everything you need for installation in wood or drywall. For metal or masonry, make sure you have the right drill bits and appropriate screws needed for installing window treatments. To learn more about your home improvement project, check out homedepot.com/howto. Don't take any deductions from your measurements. Our factory will take the necessary steps to make sure your blinds or shades fit perfectly in your window and will operate correctly. Double check the "Mounting Requirements" section of your chosen product to ensure that your window has enough depth to accommodate an inside mount. If it doesn’t, choose an outside mount or switch to another product. Remember to measure in multiple places across the window width and height. For specific instructions on where and how many times to measure, see your product’s specific measuring guide. Our factory will make your blind or shade to the exact measurements you provide. Be sure to allow extra space for the head rail and mounting brackets, which can be up to 2 1/2-inches tall. If you want increased light blockage and privacy, add a few extra inches outside of the window space. Make allowances for obstructions like doorknobs, deadbolts or moulding that might get in the way. If you have obstructions, spacer blocks or extension brackets are available to help your blind or shade extend far enough to avoid protrusions. Decide if you want an inside mount or an outside mount before you begin the measuring process. Steel measuring tape is much more accurate than cloth measuring tape. Always measure to the nearest 1/8 inch. Don't round to a half or whole inch. Be careful about transposing measurements. Be sure to always have width and height clearly marked. Always put your width measurement first and height last (W x H). Download this worksheet to record your window details, then bring it in to your local Home Depot and select the window treatments that are right for you.